…an old and ruinous part of the House. Turning a corner the music we had been hearing became louder and at last we saw the musicians themselves. They were so involved they failed to hear us. The music was suited to the scene – a moody, romantic melody. We stopped to listen and I admit that I, too, was affected by the sound as well as by the spectacle of the masked players. Okay, here’s my latest musical theory. The viol brings the “right sense of warmth” but the guitarist is “overplaying his part.” This tells us that the viol is somehow correct while the guitar is wrong. The viol’s strings and bow make a t, and there’s a t visible in his music stand. He represents the note “TI,” which is the seventh in the “do re mi” sequence. “Right sense of warmth” is a play on TI, which sounds like tea, which is a WARM drink with jam and bread. All telling you that “TI” is correct and we should take door 7. The guitarist OVERplaying his part could be a suggestion that he is really sharp and is playing the 8th note (do) instead of the 7th (ti). He has sharp symbols all over his trousers. (I guess this makes him a “sharp-dressed man.”) The sharp symbol is also called an “OCTOthorpe,” further associating the guitar with 8. This is to help us see that the guitar looks like an 8. Its front and back surfaces both make 8, and the word “adds” in the text tells us to add them to get 16, the wrong door. 16 instead of 8 kind of makes sense here because the guitar would probably be playing an octave above the bass viol in addition to being sharp. Interestingly, that precarious block over 16 has cross-hatching — sharp, guitar, trousers, wrong door — while almost all of the other ones have just parallel lines (like the viol player’s shirt). If you just count the “ti”s that appear within words and not across words, there are seven!! The support for the viol looks a lot like a golf tee (sounds like T = ti), too! And, unlike the guitarist, the viol player is wearing a “T”-shirt under his jacket. OK, just reporting some new observations here. Vince observed down below in the comments that there are 7 notes in the scale: CDEFGAB or do re mi fa so la ti. So it’s kind of nice that 7 is the correct door in the room that is the source of music in the Maze. Building on this I did a search on the two-letter combinations “do re mi fa so la ti” and found that of all the rooms only this room and Room 4 contain all of them! A coincidence? Maybe, they are not unusual letter combinations, but it’s pretty cool. Extracting the notes and playing them in order yielded nothing particularly melodic or evocative of a familiar tune, unfortunately. Another music thing: the wall is a bunch of horizontal rows separated by a distinct dividing line. Is this meant to evoke the treble and bass clefs? Music for a bass viol (the one shown here) would be written in the bass clef, and music for the guitar would be written in the treble clef. Don’t really know that this is helpful at all but it’s kind of interesting as a music connection. Finally, considering the apparent importance of sunlight here, you can connect sun to sol (or so), which corresponds to a G if you are matching do re mi fa so to the C major scale, and G = 7 alphanumerically, matching the other Gs in the room. Not very confident about any of this, but it was interesting to explore. Thanks to the wizardry of Factitious, you can now hear the song hidden in the text of Room 36! Check out his “Room 36 song” on User Blogs > Ben’s Maze Facts on Mazecast dot com. It’s the viol player’s fingers and bow that work together to make the sound, so perhaps it’s those elements that we should be following. The viol player’s fingers on his left hand point to to 7. And if you imagine him playing, the movement of both his right elbow and his bow also point to 7. So the elements of the player that are making the music that brings the “right sense of warmth” to the piece all point to 7 — the correct and “warm” door, and also the one on the “right” side of the viol player, from his perspective. Still plugging away at this room. This part of the text suggests that the guitarist’s playing is extrospective (outward-looking, the opposite of introspective), and that that is a good thing. The guitarist is looking directly out/away from the room 7 doorway, so take that door. I guess “brings right sense of warmth to the piece” could also refer to a “piece” of clothing, in this case his shirt, which (as others have noted) has 7 white (warm) stripes. Further thoughts on this room… could “piece” in the fourth paragraph be referring to that unusually large chunk of masonry in the foreground? Or maybe the one just below the viol player? Either way, those pieces go from dark to light, with the “warm” side being on the right, from the perspective of the viol. And the viol’s pointy support thing points at both of them. The “warm” side of those pieces, in turn, point to the correct door. So “viol brings the right sense of warmth” directs us to follow the warm side of either of those pieces. Another thought on the instruments. I know everyone hates an alphanumeric solution, but here we have a Guitar and a Guitarist. We also have a viol and its player… apparently this kind of viol is also called a viola da gamba, or simply a Gamba. And its player is called a Gambist. That’s a lot of G words, considering the players and their instruments seem to be the most significant things in this room. And yes, G = 7. This room is all about sound and hearing. “Viol” sounds like”vile” so don’t take viol’s door. I looked it up, “viol” is in fact, for some strange reason, pronounced “vile.” I’m adding it to the summary! The white edge of the inner wall in doorway to 16 neatly splits the entrance, suggesting you split the number as well. The guitarist “overplays” his part, suggesting we look at what the guitar overlaps in the picture. The neck of the guitar ends at the midway point of the 16 door, further leading your eye to that split. The stone above 16 about to fall down also suggests “breaking” the number apart and its edge is exactly between the 1 and 6. There is a sort-of plus sign in Tragedy’s music stand (weak). In sort of a general way, the two players playing two parts to produce a single melody (the music was suited to the scene) sort of suggests the addition of two numbers to get a single number. There’s a hidden “45″ in the vines above one of the unmarked exits. There’s a hidden door! It would be cool if there was a secret Path door along the Loop. I don’t see the 45, it is probably just my eyes, but which door is it over and is it written in the same font/style as the other numbers in the room? The music stands could be claw-things. So could anything with handles vaguely – amphorea or chamber pots. The light through the door probably helps us confirm that this is where the sun in 19 “looked”. Room one has a “look” clue and the sun “looks” through the door there – the sun “glared” at him. The “part” puzzle in 19 also helps confirm he is singing here, but really only after we pretty much know he’s singing here, and we know his shadow is in 35. I’m in the process of reworking my page. I’ve not gotten to any of the rooms, but the main page is redone at least in first draft form. There are 7 V’s in the text. V sort of looks like 7 if you flip it around. The arches are upside down V’s. Because 7 is sort of V-shaped? Maybe also a weak indicator of 7′s shape? This might have been mentioned already but “Turning a corner” would only occur if you go through 7. Amiright? Well, they turn a corner to enter the room. I think that could happen from any of the entrances, since we can’t see too far beyond them. The doorway to 16 certainly seems like the hall makes a sharp turn not far through the doorway. 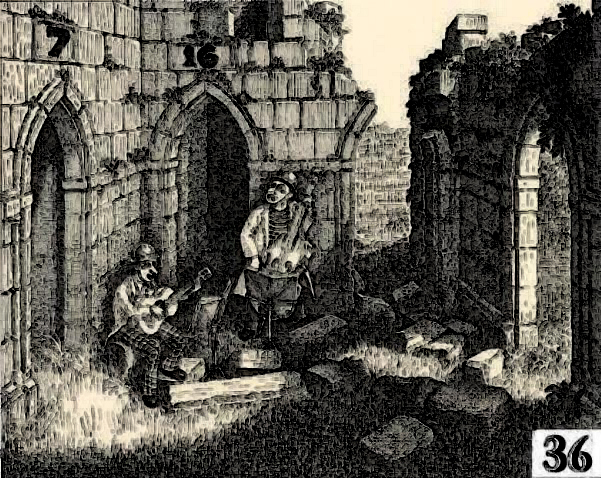 It may be straightforwardly clued (no more straightforward than the masks of the players) that the entrance to 7 is by far the least ruinous; the solution depends then not just on the slightly accented stone, but upon the entire ruins of the environs. Note that the “turning a corner” sentence contains a dangling participle, unless the music is what is turning a corner. The “slipped past the musicians” line, if you came from 16, pretty well indicates you shouldn’t go back to 16, since that wouldn’t involve slipping past any musicians. That has the side effect of suggesting 16 is not the correct door period, since if returning to 16 were the wrong path having come from 16, it should also be the wrong door coming from anywhere else. Anything we can do with “romantic”? Roman numerals anywhere? VII? Something about there being seven notes, A – G…it seems as legit as the 13-cards-per-suit association in 27. Alright, alright, don’t want to play the repetition game, but the tying together of the music with the room (“[t]he music was suited to the scene”) and the mention of warmth (“[t]he viol brings the right sense of warmth to the piece”) really seems to point toward the door to 7, which is bathed in sunlight, as opposed to the darkness of 16. That the guitarist is errant in “overplaying” his part, combined with his guitar overlapping the door to 16, seems like another disincentive to take that door. (Whether you see his error as literally playing overtop of the wrong door, or in indicating a door number that is higher than the correct number, the guitarist is playing incorrectly and is connected to door 16.) On the other hand, the emotive quality of his playing is correct, and the eyes of his emotive mask seem to point toward 7. Interestingly, the Guide states that the VIOL brings the right sense of warmth to the piece, not the musician playing it. The musician overlaps the door to 16, but the viol does not seem to. On the other hand, the GUITARIST is overplaying his part, and his body clearly extends into the frame of 16; specifically, his fretting hand. I’m really surprised not to see this solution of vw’s on the board! “Right sense of warmth” in text, suggesting that “warmth” = right (correct) door, and then you have the wall and doorway for 7 bathed in full sunlight, as well as the grass leading up to and into it, whereas the doorway and grass leading to 16 are more in shadow. Adding in a bit more context it is the viola (next to the wrong door on the right-hand side) which “brings the right sense of warmth” so on this level the phrase appears to point a bit more strongly to Door 16 than Door 7. So if we’re looking at the viol, it seems like the viol is angled so it faces door 7, so the music it is making is “aimed” at 7. If the viol playing is described as “right” and “warm,” it means we follow its music and pick 7. 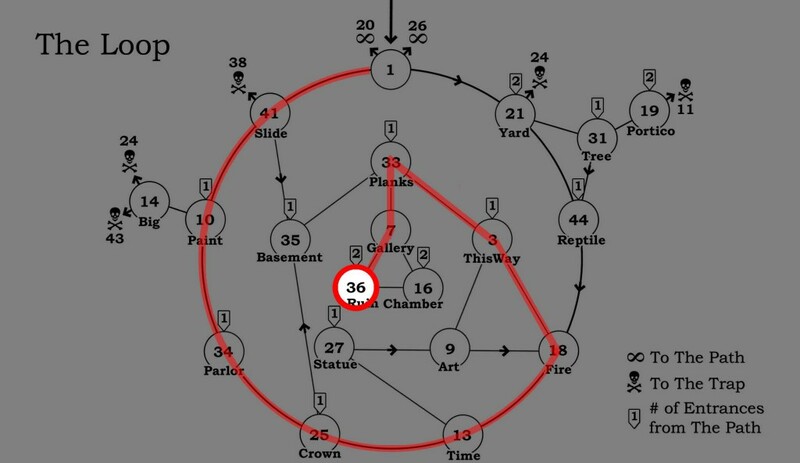 “Reminded” occurs two places in Maze – 22 and 16. He is reminded of a theatrical backdrop and reminded of his neighbors. In 16 “his neighbors” can be in the room next door, here in 36 (although on some level it also means native Americans and also means Ursa on another level). Theater in 22 also connects to Comedy and Tragedy here. (also see my page for more connections between 16 and 22 already mentioned). Also, if the the guide is the guide to the true path (The Tao) then Yin and Yang as neighbors makes pretty good sense too.